Our beaches on the East coast of Florida are not as well known for shell collecting as they are over on the Gulf Coast. Visit Sanibel Island and you are likely to go home with a fabulous assortment of beautiful seashells. We have to work harder to find shells on the East coast beaches, and then, many shells are the same. Arks, clams and coquina shells can usually be collected in the New Smryna Beach area. But, travel off the beaten path – out to the islands and backwater – and it’s possible to find something more unique. Only boats can reach this place so it’s mostly tourist-free. It’s the best part of Florida. We took the boat out toward Ponce Inlet and stopped at a sandy island which appears when the tide is out. The water was just beginning to come back in when we dropped anchor in the shallow water. I love to be out here, away from people… as you can see, we had the place to ourselves. It helped that the weather forecast was cloudy with possible storms – and it was the middle of the week. Most boaters stayed home….lucky us. Across the waterway, to the left of this photo (above), is Disappearing Island. It’s like this place, only larger, and the name says it all. At high tide these islands “disappear” beneath the ocean, with only some of the scrub trees left above the waterline – or so I think. I’ve never been here at high tide. I waded ashore and began to scour the shoreline, searching in all that grass, hoping to find a cool shell. I found most of these shells up along this grassy edge of the island. I found a lot of large clams, partially buried in the sand. In fact, most of the shells were either whole, or pieces of big clams. 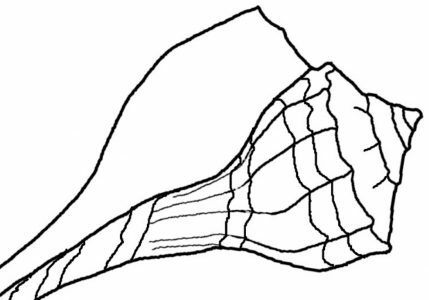 Also the Southern quahogs were numerous, which are white with vertical lines along the shell. But I did find a nice Dosinia shell. It’s the flat, roundish shell at the bottom of the photo below. I also happened upon that cute little shark’s eye which was partially buried. It was pure luck that I noticed it! I’ve come across much bigger ones, but they always have a hermit crab inside. Broken Crown conch, mussel, clam, tagelus, dosinia, little shark’s eye, and tiny marsh periwinkles (one sits on top of a penny). The little shark’s eye shell (below) has a hole drilled into the side. That is how the mollusk inside was killed. Something came along and bored into the shell to eat what was inside. The thing is, Shark’s eyes ARE predatory, and this guy would have done the same to another shell! As the water came up, I headed up onto the sandy dune area to search among the scrub brush. I wondered if I’d find some sort of seashell treasure up there. And I did! This is where I found those three little white Marsh Periwinkles (photo above) – or at least I think that is what they are. They were all found close together and nothing was inside except sand, so I picked them up. I’ve never seen these before, so I had new shells for my collection. Nice…. I had to be careful not to lose them, as they are tiny! I found some trash, of course, and what looked like an old campfire pit, and saw some mourning doves – that was a surprise! I really thought that all I would see were shore birds. I came across the remains of a coconut. It had traveled from the mainland or beach peninsula, because there were no coconut palm trees on that island. Remains of a coconut, with partial outer and inner shell. We left later in the day when the clouds were thickening up. The water had come in quite a bit by then. Soon the all that sand would be covered, until the tide began it’s journey back out to the sea. I wonder what treasures it will leave behind. Can’t wait to return here. Looking toward the Ocean, with a view of high-rise condos beach-side.